Home » Tiger's Den » What is Tiger’s Den? As our department is based within the Department of University of Recreation (UREC) on LSU’s campus, we have the unique opportunity to partner on a daily basis with some of the most accomplished professionals and equipment within the recreation industry. Furthermore, we enjoy access to the huge array of resources, programs, and individuals that accompany one of the top tier universities in the United States. As such, our camp programmers make a strong effort to incorporate into our daily activities grounded research and new ideas, which includes innovative models of healthy living, wellness, and sustainability and theories regarding the impacts of physical education on academic achievement. Our guiding principles are Fun, Enthusiasm, Compassion, Discovery, Humility, Leadership, and Community. 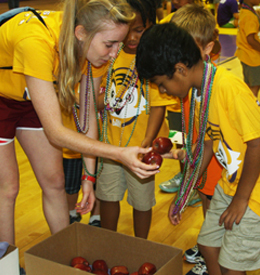 These principles serve as the foundation for our activities, which are designed to impact and encourage social growth in our campers, in areas such as teamwork, community living, healthy sportsmanship, and positive competition. 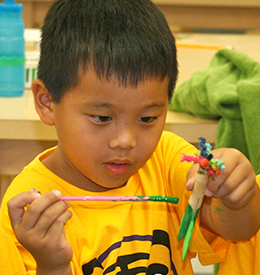 We combine creativity and cooperation with individual challenges, which impact critical thinking skills and encourage a greater sense of confidence and self-esteem. Personal and physical growth also tends to occur naturally and their individual gains such as honesty, trust, communication and friendships are some of the dividends. 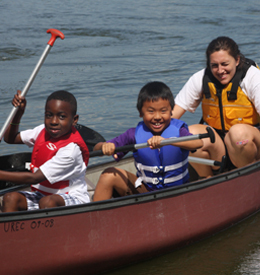 We see camp as the special opportunity for a child to experience the fun and excitement to be found on campus, in an environment that removes the academic and social pressures that are a part of our children’s lives. Our plan is that this experience satisfies that need with happy, relaxed, but well-structured programs. Our goal is that all who attend Tiger’s Den receive a supremely unique experience, one that is treasured and cannot be found elsewhere. 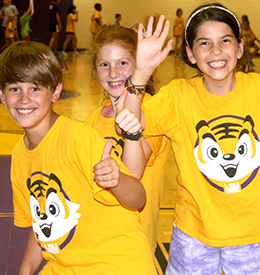 LSU UREC Tiger’s Den is a recreational experience that provides fun and comprehensive camp programming for children ages 6 to 12, where each session is filled with sport activities, structured games, sport skill instruction, and interactive educational activities, all incorporating Tiger’s Den Values. Summer camp is about fun! At Tiger’s Den, the goal each day is for every camper to experience a fun and positive environment through the wide variety of unique daily activities. 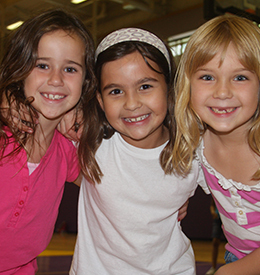 Summer camp is a unique opportunity for all children, and at Tiger’s Den we promote an atmosphere where enthusiasm for all things is celebrated and seen as a success. 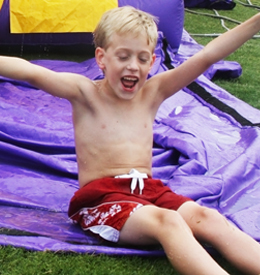 The safety and happiness of campers is our primary concern. At Tiger’s Den, we maintain an environment where treating others with care, respect, and compassion is paramount to a positive experience. Teaching is the art of assisting discovery, and at Tiger’s Den, we educate in an informal manner by providing children the opportunity to discover things about themselves and the world that surrounds them. Humility is a crucial aspect of child development and at Tiger’s Den, we ensure campers learn what it means to be humble regardless of success and to treat others with respect and integrity. Leadership is an acquirable skill and at Tiger’s Den, we intentionally create opportunities where children can grow and develop their leadership capabilities both in individual and group settings. 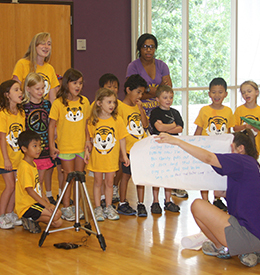 We enjoy a very diverse community of campers and counselors and at Tiger’s Den, we seek to illustrate to campers the benefits of teamwork while emphasizing a definition of success not based on winning. For more information on 2016-2017 Tiger’s Den, please contact our Camp Director, Ryan Reed at reed1@lsu.edu or 225-578-7029 for more information.